Will Both the Best Picture and Best Director Oscars Go to The Revenant? Over the last few days, we’ve done a deep dive into the four major acting categories, but now we come to two Oscar races that are even bigger: Best Director and Best Picture. The Academy has shown a recent propensity for splitting these wins up, but this year, might The Revenant take home both trophies? Let’s tackle each contender in these two races, starting with the least likely to win. The fact that Abrahamson made it onto this list over veterans like Steven Spielberg and Ridley Scott is really something, and if it offers a career boost to this eclectic director (who also made the wonderful Frank and What Richard Did), all the better. But a win here would be predicated on a general Room surge that simply hasn’t happened. Light a candle for poor Tom McCarthy, who made one of the best movies of the year, yet saw his direction discounted because the film had the good sense to be modest. No, Spotlight doesn’t “look like a TV movie,” as the film’s detractors would posit; this is a judicious, sharp, subtle movie told in wide and medium shots and put together perfectly. Alas, that just doesn’t seem to be in line with what the Academy is looking for in this category these days. When The Martian director Ridley Scott failed to make the final five, many thought that would clear a path for the deserving George Miller, who made the sort of action movie that hardly seems like it could be made at all. I’ve still talked to many voters who are picking Miller — there are some die-hard Mad Max partisans out there, and they will ride shiny and chrome until the fuel runs out — but his primary winner’s narrative, that he made the most technically audacious movie of the year, has now been superseded by Alejandro González Iñárritu’s The Revenant. While this award is certainly Iñárritu’s to lose, there is still a case to be made that The Big Short could take Best Picture … and if it does, you never know what could happen with McKay. Many are impressed by his ability to take dense source material and make it palatable to the masses; even more irresistible is the director-made-good narrative behind McKay himself, that the man who helmed Will Ferrell comedies like Step Brothers could then turn out a top-tier, star-stuffed movie about the financial crisis. If The Big Short takes home some bellwether awards in the early going — like Best Supporting Actor or Best Editing — then McKay is primed for an upset in this category. It’s impossible to overstate what Iñárritu managed to accomplish with The Revenant: He took what could have been a grimy period piece and made it into an audaciously brutal drama that somehow then became a blockbuster hit, he pulled a largely mute performance out of Leonardo DiCaprio that will likely deliver the actor his first Oscar, and he is poised to become the first director in history to helm two back-to-back Best Picture winners. The odds seemed to be against him during the entire making of the movie, but when it comes to winning an Oscar, they’re finally in his favor. Steven Spielberg’s period drama started well — in the fall, many of the older voters I spoke to considered it their consensus pick — but it faded over time as other fact-based movies like Spotlight and The Big Short came to the fore. Steven Spielberg, Tom Hanks, and Mark Rylance were booked all season and unavailable to do much campaigning; this one likely made it into the Best Picture category by the skin of its teeth. This is a sweet little film that many Academy members hold close to their hearts, but it’s unlikely to win either of the other two Oscars it’s nominated for — Best Actress and Best Adapted Screenplay — and modern movies have no shot at Best Picture if they fail to prove their mettle in any other category. Once upon a time, many of my fellow pundits thought The Martian was the front-runner for both Best Picture and Best Director, but then Ridley Scott failed to score a nomination in the latter category, and the film didn’t benefit from the same sort of protective surge Argo got after Ben Affleck was snubbed. Two things worked against it: Team Martian couldn’t successfully create a narrative that the film was much more than a fun blockbuster, and two other technical marvels — Mad Max: Fury Road and The Revenant — stole its thunder in the below-the-line categories that The Martian would have needed to rely on for momentum. Of the top five contenders for Best Picture (meaning, the films that also scored a Best Director nomination), Room likely inspired the most emotional reaction. That’s something that can’t be discounted. Still, while Brie Larson is poised to win Best Actress and Room director Lenny Abrahamson managed a surprising Best Director nomination, I still talk to industry people who simply won’t see this movie because they’re so turned off by its kidnap-victim logline. That those same voters will eagerly watch a film like The Revenant is odd to me, but I can’t argue that it limits how far Room can go. This is not the sort of movie that gets nominated for Best Picture. A wildly over-the-top action movie that’s both sequel and reboot, that came out in the early summer and netted no acting nods? There’s no precedent for it. That’s my way of saying that Mad Max could go on to defy the conventional wisdom and take Best Picture despite winning at none of the bellwether guilds like the PGA, DGA, or SAG, but my guess is that whatever gas is left in the Mad Max tank runs out here. Back when I called Spotlight the front-runner-so-far out of the Toronto Film Festival, I noted that a film this intimate could be overtaken by flashier contenders yet to come. Well, they came along, and while Spotlight still won an important victory with the Screen Actors Guild, that voting body isn’t nearly as Oscar-predictive as the DGA and PGA, where its primary competitors triumphed. Spotlight also faces a steep path to victory in any categories beyond Best Original Screenplay, and most Best Picture champs require more wins than that. It’s a close race at the top, but unless Mark Ruffalo pulls out a surprise Best Supporting Actor triumph, Spotlight likely can’t go the distance. Many of the same problems that plague Spotlight also hinder The Big Short — the only win it’s positively assured of is Best Adapted Screenplay — but an awfully close race against Mad Max in Best Editing could tip The Big Short’s way, which would give the movie enough other wins to fit the profile of a Best Picture victor. The movie also has the best precursor working in its favor: All seven of the last Best Picture winners first triumphed at the PGA, as The Big Short did. This one’s a nail-biter. Ultimately, though, I’m picking The Revenant to win. The movie has momentum at the box office and scored with the DGA, and is assured of taking home several awards — among them, Best Actor, Best Cinematography, and Best Director — with several more below-the-line wins a real possibility. No film since Titanic has won Best Picture without a screenplay nomination, but like that movie, The Revenant is a major spectacle, and it’s possible that the virtually voiceless lead character limited the movie in the Adapted Screenplay category anyway. There are still a few precedents working against The Revenant’s win, but they’re not as significant, I think, as the shallow category support for the movie’s two main rivals. If the movie can win early races in the sound and visual-effects categories, you can call this one for The Revenant halfway through the broadcast. Still, what a race it’s been! 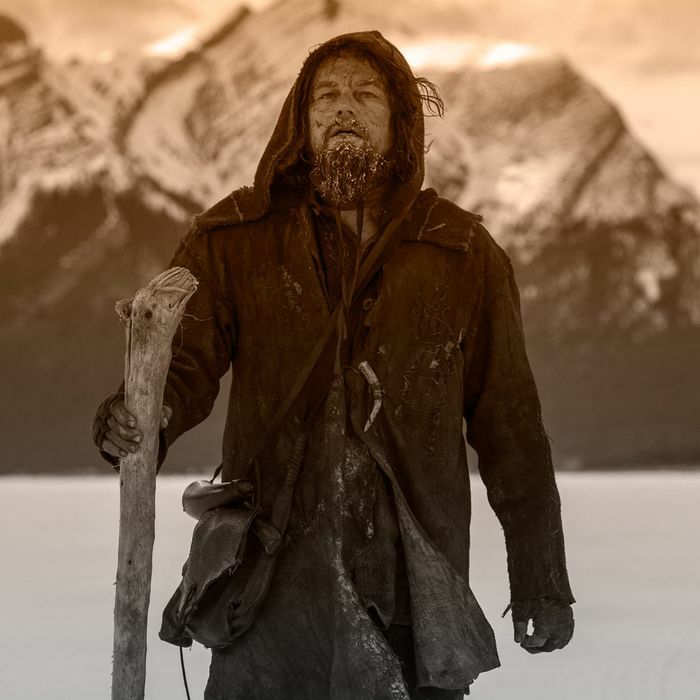 Will The Revenant Take the Top Two Oscars?